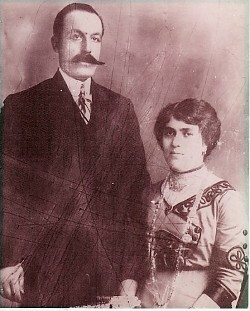 Above: His parents, Stefanos and Victoria. Above Right: Wingham, New South Wales. In the late, 1930's. Above: With friends. Dimitrios (right) was serving in the Australian Land Corps (in the Second World War) at the time. Above Right: In the kitchen of the Bridge Cafe, Macksville. L-R: his sybetheri and partners, Marianthi and Ioannis Kafes; Dimitrios himself; his wife, Stavroula; and horiano, "Stan" Kostas. Above: With horiani, Alkis, Chrystofia and Andonios Tsakiirs at the counter of the Bridge Cafe. .